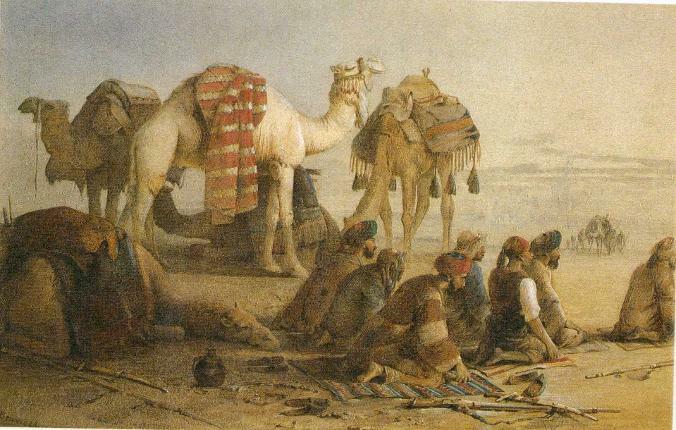 Joseph Austin Benwell’s painting 'A group of Arabs at prayer, with distant camels' (or 'Middle Eastern landscape with figures at prayer'), shown below, appears to be a replica or exact copy of the very large oil painting 'Prayers in the Desert' (1843) by William James Müller (1812-1845), displayed at the Birmingham Museum and Art Gallery. Benwell’s watercolour, also in an arched mount, is much smaller (c 17cmx30cm) but otherwise identical in composition and is signed J A Benwell lower right. 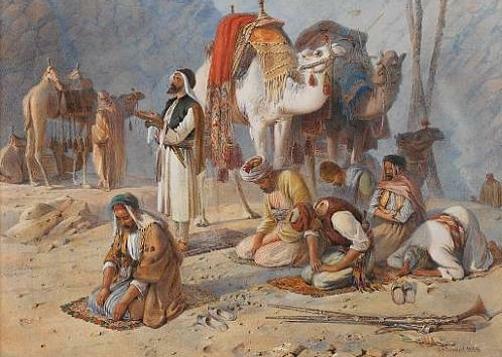 Müller’s ‘Prayers in the Desert’ is important as the first British painting to show Islamic religious practice and postures of prayer. What is the history of the Benwell version? 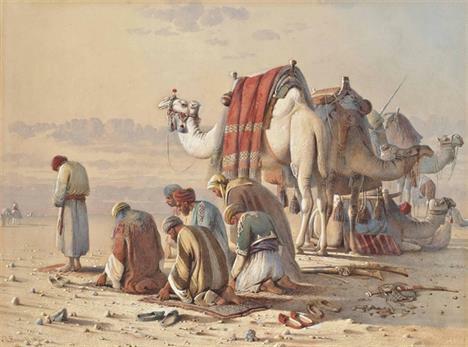 'A group of Arabs at prayer, with distant camels' (or 'Middle Eastern landscape with figures at prayer') watercolour signed J A Benwell (lower right). 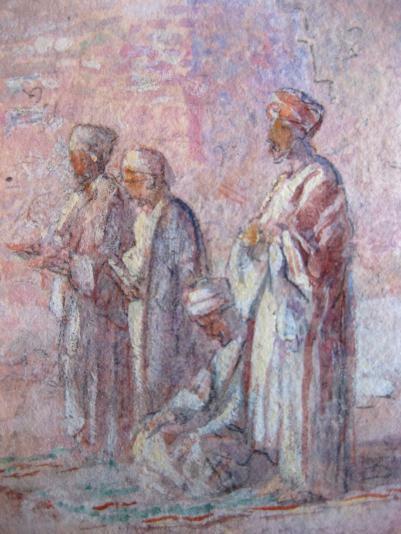 Research into the recent history of Benwell’s painting has revealed that it was offered for auction by Phillips of London in 1998 (as ‘Arabs at Prayer in the Desert’), by Bonhams in 2011, and by Dreweatts & Bloomsbury of London and Bristol in 2003, 2007 and 2012. The artist was given as Joseph Austin Benwell, except for the 2011 auction, which stated 'Circle of Joseph Benwell'. 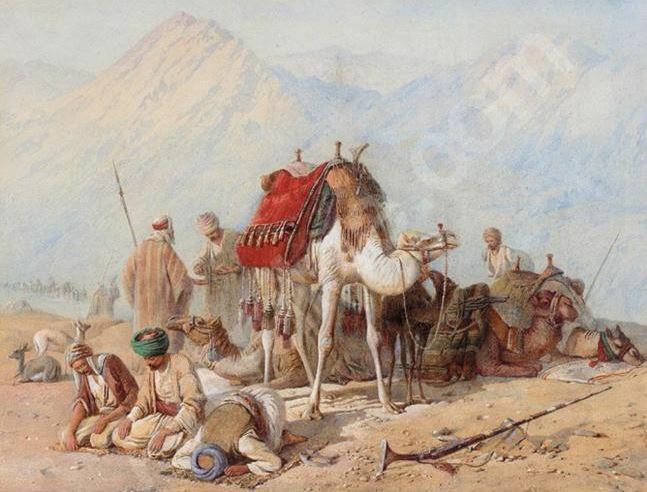 References were not made to William James Müller or that the watercolour may be ‘after’ Müller’s ‘Prayers in the Desert’. It seems strange that no one in the art world appeared to have picked up on this. It was not until 2013 after I visited Birmingham Museum and Art Gallery and saw 'Prayers in the Desert' for the first time that I realised the two paintings were virtually identical in subject and composition. After the 2011 auction I contacted the auction house to enquire why it was being sold as 'Circle of Joseph Benwell', and not directly attributed to the artist. I was curious as to the reasons behind this - i.e. why was it 'signed' in his name in the first place? What is the reasoning supporting the fact that the painting is not actually by him? Also, I had never heard of a 'Circle of Joseph Benwell'. I don't believe he was particularly well known at the time, therefore why should someone want to sign his name? The auction house confirmed that it was originally fully attributed to the artist but later the signature was questioned and the picture was checked with their London specialists, who considered the signature to be wrong. 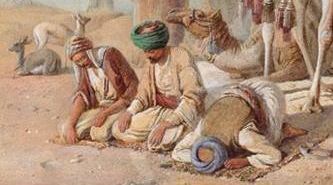 The figures are very similar to those in Benwell's other paintings, for example those in 'Praying to Mecca', 'Arabs praying in the desert, caravan of camels beyond', 'Halt for prayer under Mount Horeb'. Most of Benwell's paintings were watercolour/gouache, and those that we know about today were executed from the early/mid 1860s onwards to his death in 1886. His early (published artwork) mainly comprised engravings/wood cuts, illustrations for books and journals, including the Illustrated London News, mostly depicting scenes from India and the Middle East, during the 1850s (possibly earlier) and early 1860s. Many of these depicted figures and groups of figures. Like Müller, Benwell's family was from Bristol, and Benwell lived there as a boy before he travelled to India, China and the Middle East in the 1840s. Then he moved to London, probably in the early 1850s at about the time of his marriage (Benwell was in Bristol in the 1851 census). William James Müller was born in Bristol, and was the son of J S Müller (also known as Miller) originally from Danzig and the curator of Bristol Museum. 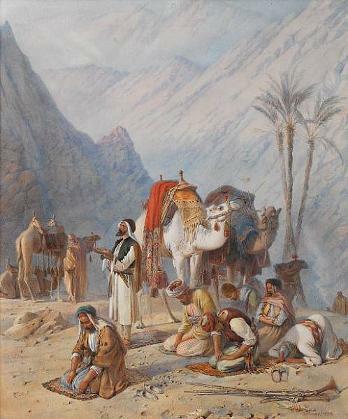 'Prayers in the Desert' by William James Müller (1812-1845), at Birmingham Museum and Art Gallery.Note this is an oil painting and much larger than Benwell's image. Height 106cm x width185cm. The BBC 'Your Paintings' website also has an image of William James Müller's large oil painting 'Prayers in the Desert'. 1. It is possible that Benwell (b. 1816) could have been a pupil or junior associate of Müller (1812-1845). Another Bristol artist, Charles Branwhite (b. 1817), of a similar age, is noted for being a pupil and follower of Müller, as were others. Almost certainly, they would all have known one another in the Bristol art community of the 1830s and 1840s. Could Benwell have ‘copied’ the work as part of his studies/instruction in painting? If so, this painting may well be an ‘early’ Benwell. 2. This still doesn't explain why there is a signature J A Benwell in the lower right corner of the watercolour, even if the signature looks 'wrong'. Benwell's signatures did seem to vary – upper case or lower case, slanting slightly to left or right. If it isn't his signature, why should someone else want to put Benwell's signature on the painting? Particularly if it is a copy of Müller’s ‘Prayers in the Desert’. Although Benwell exhibited quite widely he is/wasn't a particularly famous artist. Was the signature added at a later date? If the watercolour is not by Benwell, who is it by? 3. Benwell was an engraver and illustrator before he started producing watercolour paintings in earnest from around the mid 1860s, possibly earlier. It was often the convention when an engraving was produced for the original artist to sign on the lower left hand side (sometimes followed by the word DEL- delineavit - Latin for ‘he/she drew’). The engraver, if there was one, would sign on the lower right hand side. Most of Benwell’s earlier wood-cut engravings are signed on the left or left-centre as he was both the artist and engraver. Others that he signed on the left have the signature of another engraver on the right (Benwell was the artist but not the engraver in these). Some he signed on the right, when he was the engraver working in collaboration with another artist to produce an engraving from that artist’s original piece. The fact that the signature on this painting is on the right could indicate Benwell’s role as not being the original artist, but copying in the same way that an engraver would add his name on that side. Obviously the same convention does not apply to paintings, but old habits die hard. Again there may be a possibility that it could be an early Benwell, bridging the gap between a figurative engraving and figurative watercolour. 4. Obviously there are differences between an oil painting (Müller's is darker) and a watercolour, but the images are otherwise almost identical. I believe the watercolour to be genuinely old, in an old frame and the back of the watercolour shows signs of age, although the mount looks more recent. The painting also has Benwell's characteristic colour-grading of the sky (from pale orange to bluey-grey) across it. 5. The similarity in the praying figures may be due to both Müller and Benwell using the same source material. 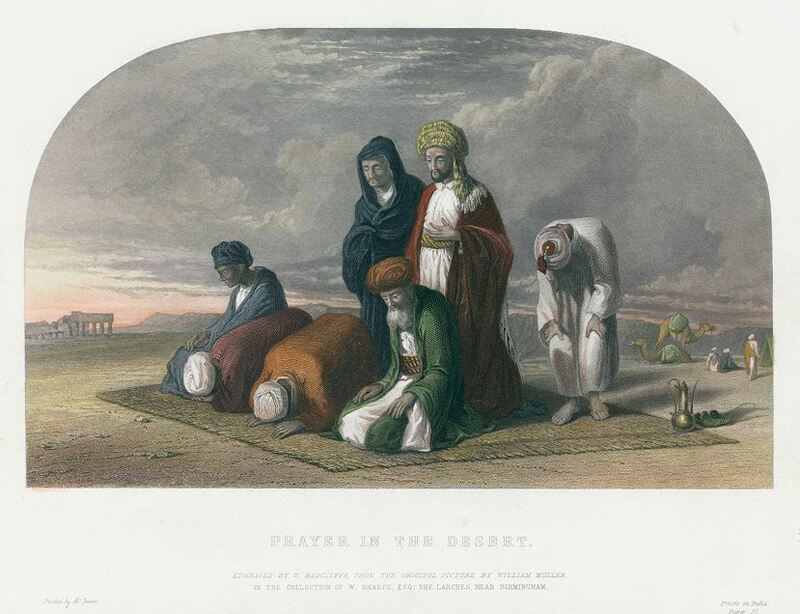 Although Müller travelled in Egypt, Prayers in the Desert was painted in England and the figures are based on illustrations ‘Postures of Muslim Prayer’ (pages 76-77) in Edward William Lane’s ‘An Account of the Manners and Customs of the Modern Egyptians’, published in 1836. This book was an important source of information for British artists painting Egyptian subjects, and it is possible that Benwell also used it as a guide for several of his watercolours (examples shown below). 6. It is worth noting that Benwell's works, whether his engravings or paintings, almost always feature figures as the main point of interest, unlike Müller and Branwhite whose works also included many landscapes. 7. It is noted that the image has been reproduced before, for example there is an engraving of Müller's 'Prayers in the Desert' by William Radclyffe engraved ‘after a picture by William James Müller’, published in the Art Union Journal in c1847 as ‘Prayer in the Desert’. This steel-engraved print with ‘recent’ hand-colouring has different colouring for some of the clothing (see below). 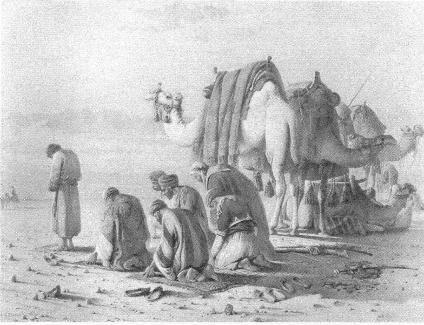 'Prayer in the Desert' engraved by William Radclyffe after a picture by William James Müller, published in the Art-Union Journal 1847. Copy also in the British Museum. ‘Postures of Muslim Prayer’ (pages 76-77) from ‘An Account of the Manners and Customs of the Modern Egyptians’ by Edward William Lane, first published in 1836. The book was an important source of information for British artists painting Egyptian subjects. Some examples of other paintings by Joseph Austin Benwell depicting figures at prayer are shown below.